There are two kinds of speakers: those that are nervous and those that are liars. 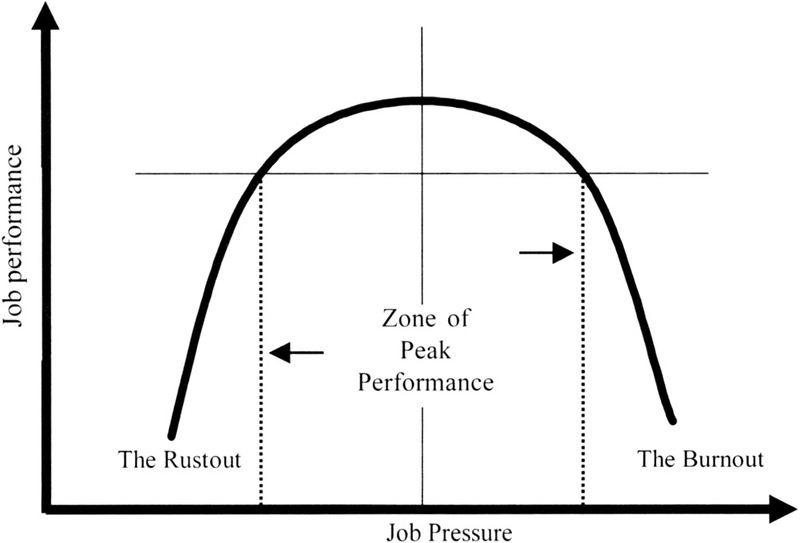 As job pressure increases, performance increases up to a certain point and then declines thereafter. The rustout lacks enough pressure in his job to bring forth his best performance. The burnout has too much pressure, has passed the peak, and has slipped down the performance curve. Highly effective presenters have learned to perform at the top part of the curve - not too much pressure, not too little. The zone of peak performance is where we do our best work. It is analogous to running a marathon. Some people just don't have the motivation or the energy to train enough. They may start the race, but they are too rusted out to finish. At the opposite extreme is the burnout. Burnouts have overtrained and overtaxed their bodies, so that when it is time to start the race, they are sidelined. A better place to be is the zone of peak performance. Increase your sense of control. Six methods to control anxiety. Change nervous energy into focused presentation power. For example, it is important for you to ensure you are making attributions related to effort and/or the need to develop skills rather than ability. For example, if John is having difficulty organizing his topic and he tells himself that he just doesn't have the ability to present, then he has told himself that there is really nothing that he can do about his problem. The probable consequence of this type of attribution is that he will feel badly about himself because of his perceived deficit. On the other hand, if he tells himself that his presentation difficulty can be overcome by more effort, more time, more practice, or by developing better delivery skills or finding a good presentations coach, then there is something that he can do about his problem. The trick is not to be helpless and reactive. We have a choice: be helpless and reactive or be empowered and proactive. Our choice lies in learning how to monitor and change our self-attributions. Attribution theory deals with how we react to difficulty or obstacles. In this section we are specifically interested in the attributions you make or the things you say to yourself about yourself when you encounter a difficulty or an obstacle. There are two main categories of attributions: those dealing with effort and those dealing with ability. Each of these attributions will result in markedly different types of behaviors as illustrated in Figure 6-2. Focused presenters continually instruct themselves to take control and become active no matter what obstacle they are facing. In the following example, there were unforeseen circumstances that were impossible to ignore. Aaron: It was February 1, 2003 and I was to be the opening speaker at a conference set to begin 9 a.m. in Arlington, Texas. At about 8:40, I overheard someone who had just arrived discussing the space shuttle Columbia. News of its tragic explosion and disintegration directly overhead was unfolding and spreading by word of mouth. Yet, by 9 a.m., as the program began, the majority of the 200 people in the room had not heard anything about it. The conference chairperson opened with this: "I just heard from my husband that we are being instructed to stay inside because potentially hazardous debris is falling all around us." "What?" someone shouted. She replied, "Debris from the space shuttle!" "What are you talking about?" "The space shuttle - it just exploded above us!" At this point, the situation was chaotic. No one was sure what had happened yet, and everyone felt devastated. And I was up next. I knew the audience was not likely to hear my presentation and I thought about discarding it. I then thought it better to ask the audience what they preferred. So I opened with an acknowledgement of what we knew. I explained that what I had to say that day was not as important as what was happening. I asked for a moment of silence in recognition of the astronauts who had just lost their lives. And then I asked if they wanted me to proceed. Unanimously, they said yes, proceed as planned. The program went on by audience request, though more subdued than normal. Afterward, I received many wonderful comments from participants thanking me for the manner in which I handled a difficult situation. In this case, Aaron made the right decision by listening to his self-talk. One way to help you take a better look at the attributions you make and how they subsequently affect your behavior is to examine your self-talk. Your self-talk, also known as self-statements, inner speech, or internal dialogue, plays an important part in determining your behavior. As a child, one's self-talk is completely external. For example, a little boy learning to talk would say to himself, "Johnny, put ball in box." As the child grows older this self-talk becomes more rapid, fragmented, and subconscious. Unless close attention is paid, most adults do not fully realize what they are saying to themselves or the way in which their self-talk influences their behavior. Talk-irrelevant. This includes talking to yourself about anything other than the target behavior or task at hand. For example, "I should have gone into another career where I wouldn't have to make presentations." Self-depreciating. This includes any statements where you put yourself down, such as, "I never could present," or, "I don't even like to talk in small groups, how can I present to a formal audience?" Task-depreciating. This includes statements where you denigrate the importance of the task, such as, "There are no opportunities for advancement in this organization anyway, so what's the use of knocking myself out over a presentation?" Because I haven't started working on my presentation now, it's already too late. What's the use of "another" look at this topic? No matter how hard I try, I just can't come up with a creative title. I find organizing this presentation very difficult and frustrating. Whatever I put together will not be good enough. I am frustrated with not being as articulate, creative, or polished as other presenters I know. I take too much time formulating ideas and sentences. I'm just not smart enough. Task-relevant. This type of positive self-talk occurs when you coach yourself to stay focused, for example, "I have one hour to work. What do I want to accomplish?" Self-appreciating talk sounds like: "I worked well this morning," or, "This paragraph is well organized." Task-appreciating talk sounds like: "Being able to make excellent presentations gives me more choice in the kind of work I do." My job prospects will be improved as my ability to give presentations improves. With consistent planning and good work habits I can write and complete my presentation by the scheduled date. My colleagues or friends will be very helpful and they will give me excellent feedback on what works and what needs to be improved. Starting to work on a presentation is always difficult, but it works out in the end, so worrying is not productive. My presentations have improved, my thinking is more sophisticated, and the ideas are good; the language just needs some polishing. The best way to find out what kind of self-statements you make is to use a sampling procedure to help you analyze your self-talk. Writing down your positive and negative self-statements as you work or think about working on your presentation can help you do this. But instead of keeping track of your self-talk all of the time you are working on your presentation, which would be very distracting, select several time periods during which you will collect this data. For example, you may want to monitor your self-talk when you start working on your presentation, when you stop working on your presentation, or when you think about working on your presentation and decide not to. Exercise 6-1 has been designed to help you record this data and should be recorded for a period of one week. Using the template that follows as a guide, keep a record of your presentation-related self-talk for one week. In the left-hand column, record all task-irrelevant, self-depreciating, and task-depreciating self-talk. In the right-hand column, keep a list of your task-relevant, self-appreciating, and task-appreciating self-talk. You may wish to develop a code for frequently occurring self-talk, for example, HP for "I hate presenting," NGP for "I've never been any good at presenting," or BTIT for "That's better than I thought," NGEx for "The point is excellent, now all I need is a great example." Research on self-fulfilling prophecies. Some remarkable research on the effect of changing negative self-talk to positive self-talk is worth nothing. In a series of studies on creativity, students were divided into two groups: those who had previously been identified as "creative" and those who had previously been identified as "uncreative." These students were then given various creativity tests and were asked to solve the problems while thinking out loud. The results showed that the uncreative students emitted significantly more task-irrelevant statements, and significantly more self-depreciating and task-depreciating statements while the creative students emitted significantly more task-relevant, self-appreciating, and task-appreciating statements. When the uncreative students were trained to change their negative self-talk to positive self-talk, the results indicated that these students made significant increases in originality, flexibility, and divergent thinking. In addition, there were positive changes in these students' self-concepts. Developing a presentation is a creative activity; changing your self-talk from negative to positive will improve the originality and creativity of your presentation as well as improve your self-concept as a presenter. To test this, make a concerted effort to change your negative self-talk. After recording your self-talk for one week (in Exercise 6-1), use some of the techniques that follow when you encounter negative self-talk. Use the Stop Technique. For example, say Stop silently to yourself when you first notice that you are becoming distracted, then refocus on the task at hand. Use a current negative world event to keep things in perspective. For example, when you think, I'll never get this presentation finished by the deadline, say to yourself, Compared to the war in _____ or current famine in _____, how important is this? Then take three deep breaths and continue working. Use thought reversal. For example, I hate presenting. Well, I didn't like tomatoes, spinach, oysters, or _____ either at first, but I like them now. Or change, I don't want to work this evening, to, I will reward myself with a walk in the park, hot bath, or _____ when I put in this evening's allotted time. Try this for a week and do Exercise 6-2. When you have finished, compare your self-talk recording sheet from Exercise 6-1 with the one from Exercise 6-2, when you actively intervened to change your self-talk. Keep a record of your presentation-related self-talk for week two. You should actively intervene when you realize you are engaging in negative self-talk. In the left-hand column record task-irrelevant, self-depreciating, and task-depreciating self-talk. In the right-hand column, keep a list of your task-relevant, self-appreciating, and task-appreciating self-talk. Remember, you can develop a code for frequently occurring self-talk. You may wish to develop a code for frequently occurring self-talk, for example, HP for "I hate presenting," NGP for "I've never been any good at presenting," or BTIT for "That's better than I thought," NGEx for "The point is excellent, now all I need is a great example." Many presenters suffer from perfectionistic tendencies. These tendencies usually increase during times of high anxiety, and you will need to identify the point at which your need for perfection becomes dysfunctional. One way to do this is with a cost/benefit analysis. You can ask yourself what is the cost of developing a 99-percent perfect presentation compared to the cost of developing a 95-percent perfect presentation. The cost of that extra perfectionism may not be worth it. One of our clients, Linda, found that she was so focused on developing a perfect presentation that she wasn't getting anything done. Once she realized the cost of her perfectionism and allowed herself to develop a less-than-perfect first draft of her presentation, she began to be productive. Not only did she get the work done, but it was at a less personal cost to herself. In addition, the quality of her work was as good as, if not better than, before. Besides dealing with your own expectations, many presenters often project their perfectionistic tendencies onto their potential audiences and allow these expectations to inhibit their work. One of the things that helped Sean with this problem was to say to himself that it is his audiences' job to assess the quality of his work and it wasn't up to him to do their work for them. Aaron: When I started as a speaker, I thought my goal was to be perfect. What a mistake that was. First, I learned that perfection is not possible. Next, I learned that it is not even desirable. I also learned that an occasional fumble or stumble can actually help you connect with an audience. It shows you are human and thus, more approachable. The audience reads that as "The speaker is real, fallible, and just like me." It is important to note, however, that I said "an occasional fumble." A few are acceptable; too many are intolerable. A colleague, E. J. Buray, said, "Perfection is not possible. Mere excellence will be good enough." Similarly, I learned that if we hold on to a project until it is "perfect," it will never be done. I admit, I fought this tendency all the time. I continually fussed over a project until it was "perfect." The problem was, I could always find a way to make the project better, so my work was never done. Finally, Stephen Kent, a colleague, told me of the best advice he received. He said, "Done is better than perfect, every time." When I finally accepted that wisdom, I was able to take a project to completion, comforted by the knowledge that I could always go back and make it better. But if I waited until it was perfect, I would be waiting forever. In sum, a good presenter doesn't waste time and effort striving for perfection, but they do strive for excellence. Psychologist Julian Rotter did research on locus of control. According to Rotter, people are located along a normally distributed continuum (see Figure 6-3), where one end point is characterized by people who are external and the other is characterized by people who are internal. People who are at the external end of the continuum believe that what happens to them is a result of fate, chance, luck, or external circumstances. In other words, they tend to view themselves as being acted upon rather than as actors. People who are at the internal end of the continuum believe that what happens to them is a result of their own behavior. Effective presenters take an internal stance regarding themselves in the development of their presentations. Your level of commitment to finishing your presentation. How you handle the roadblocks and obstacles that get in your way. The amount of persistence you bring to the task. The ability to forgive yourself and start over again when you make a mistake. How you control excess anxiety. 1. Commitment. It has been said that the two hardest things in developing a presentation are starting it and finishing it. Starting and finishing a presentation takes a high degree of commitment. One technique that is helpful is to ask yourself how committed you are to finishing your presentation. There are three levels of commitment: intellectual, irregular, and true commitment. At the intellectual level of commitment, you say you are committed, but your behavior doesn't match. In other words, you are not doing anything tangible and little, if any, progress is being made. At the level of irregular commitment, you work on the presentation one day, but not the next. Progress is painfully slow and when you do get back into it, you waste a lot of time trying to figure out what you are doing or where you are heading. If you are operating at the level of true commitment, you follow Stephen Covey's advice by "putting first things first." You know that you are at the level of true commitment by looking at your behavior. You have set up a work schedule and you are sticking to it. You are taking advantage of working at prime times (the time of the day when you are most alert and work and concentrate the best). You have also made sure that you will not be interrupted unless there is an emergency. One way to increase your commitment is to plan a reward for when you have achieved a milestone in completing your presentation or even a section therein. The reward could be anything from a dinner out, going to see a much-anticipated movie, a walk in the park, or a game of golf. 2. Handling roadblocks. There will be times when you are working well, there will be times when you are working adequately, and there will be times when you are not working well at all. This is to be expected. It is important to note how you handle the times when things are not going well. Let's look at how two presenters handle the same situation. Tom was working extremely well and was very pleased with himself. The following week he had to do some unexpected traveling, which threw off his whole work schedule. Tom became very discouraged, stopped working completely, abdicated control, and ended up depressed. Sue was in a similar situation, but had scheduled some extra time into her plan, just to accommodate unexpected delays. Therefore, the extra travel time did not completely upset her work schedule. Her strategy was to ask herself if there was anything she could learn from this situation, in order to prevent or minimize this type of interference in the future. In other words, she reestablished control by being solution-oriented rather than problem-oriented. Sue knew that there would be some days when she would work better than others and she did not criticize herself for the things that went wrong. You have enough to do in developing your presentation without wasting time and energy by being your own worst enemy. 3. Persistence. To run a marathon requires a great deal of training and a lot of persistence. In fact, completing a marathon has as much to do with persistence as it does with ability. A presentation is like a marathon. Developing a presentation becomes a question of putting the time in whether you feel like it or not, and it is up to you to structure your life in order to get the job done. You can do this by using techniques such as having a set time and place to work, setting manageable time-limited goals, monitoring the use of your time, or eliminating or postponing other activities. These techniques will help you to program your presentation into your daily schedule. Eventually the natural rewards of completing the presentation will make working on it easier and easier and as you build up momentum, the issue of persistence will largely take care of itself. 4. Forgiving yourself. Even with the best of intentions, we all make mistakes. One of the factors that separates the top notch presenters from their less masterful counterparts is the ability to limit the damage from the mistake and to learn from it so that it doesn't happen again. If you don't fail now and then, it means you aren't reaching far enough, and you aren't growing. An unknown genius once said, "To forgive oneself is to give up all hope of ever having a better past." In other words, you look back only briefly, to see what you can learn from that mistake, and then you resolutely turn your face toward the future. Those who cannot forgive themselves are those who keep dwelling on their past mistake or mistakes, in their mind and in their meditative moments, as though this could create a better past. I never do this. I expect to fail sometimes so, when I do, I simply say, "Ah well, that's part of being human." Part of being human is also learning to improve. I once gave a talk where the listener evaluation of "excellent or good" was only 66 percent. The next time I gave a talk (to that same group, as it turned out) I got an evaluation of "excellent or good" from 97 percent of the listeners. That never would have happened had I obsessed over what went wrong the year before. That is the secret for all of us. We are human. We will fail sometimes. But every moment you or I spend dwelling on that failure only saps us of the energy we need to deliver better talks in the future. We only have so much energy in us; what energy we have should always be employed in the service of the future, not of the past. It is interesting to note how forgiving our audiences and our society can be, if the person admits the mistake. For example, every day we hear of someone who makes a mistake, whether personally or professionally, and as soon as they admit the mistake people rush to support them. In fact, there are many times when the person who admitted it fares better in the public eye than someone who didn't err in the first place. Conversely, when you err and try to deny it, it can be much more harmful than a frank admission of the facts would have been. Bill Clinton can attest to this. Similarly, audiences forgive a presenter's blunders if the presenter acknowledges or addresses them; audiences will not be as tolerant if the presenter ignores or denies blunders. A colleague, Pat Lasaruk, told us that one of the best things someone said to her at a train-the-trainer program was: "You are going to make mistakes and do things you wish you hadn't when you are presenting. This is referred to as ‘laying an egg.’ Turn around admire your egg, hatch it for the wisdom it contains, and then move on." In other words, acknowledge your mistakes, apologize if appropriate, and proceed smarter. This is a natural part of the learning process. 5. Controlling excess anxiety. Almost all speakers have or have had anxiety before and during a particular presentation. In fact, a certain amount of stress, tension, and anxiety are necessary in order to be a peak performer as the peak performance curve demonstrated in Figure 6-1. The trick is to control the excess anxiety, not let it control you. In the section below, we will examine six methods presenters use to control excess anxiety. Just differentiating between normal and excess anxiety will help you. Some anxiety, stress, and tension are necessary. Your job is not to eliminate anxiety; that would be counterproductive. Your job is to control your excess anxiety. Normal anxiety is when you are totally prepared for your presentation. You may still be nervous about presenting, but you are confident that as soon as you get going, you will settle down. Excess anxiety is when you worry that you will forget some important points or that you will get them in the wrong order or that you don't know the transitions from one part of the presentation to the next. You start the presentation with a great deal of fear and foreboding and it never gets any better. Techniques to control excess anxiety follow. Make a checklist. Almost nothing makes presenters more anxious than arriving to give the presentation only to find that some key material or a critical piece of equipment is missing. One of the reasons that flying is one of the safest ways to travel is that the pilot and co-pilot must go through extensive checklists before taking off. Sharp presenters not only have a checklist, they have a Plan B for those times when something happens that is beyond their control, such as the computer or projector dying in the middle of a presentation, a general power outage, or other such calamities. In other words, if you plan for the unexpected, then you won't be thrown off if it occurs. And make no mistake, at some time, some type of disaster will occur. Aaron: I recommend three checklists: one for packing before you leave home, another for setting up onsite, and a third for packing up at the end of the presentation. Copies of my checklists are shown in Appendix C. Whenever I discover - always too late - that I left something behind, it's the result of not using one of these checklists. Physical activity. Exercise is the natural antidote to stress. Therefore, getting into good shape and staying in good shape is a natural stress reducer. Go for a run or a brisk walk before your presentation. If it is raining or too cold, go up and down the stairs, jog in place, or do a few push-ups. Presentations author Aaron Peoples suggests you can release tension by pulling at the rungs of the chair you are sitting in or pushing up under the table at which you are seated to alternately increase and release the tension. Please note that this needs to be done as unobtrusively as possible. And don't overdo it; you don't want to look as if you are in the middle of a workout. Deep breathing. Rapid, shallow breathing increases stress, but slow, measured, deep breathing is nature's tranquilizer. Try it the next time you feel nervous prior to taking the platform. Take 10 deep breaths over the course of one minute - three seconds to breathe in and three seconds to breathe out. By concentrating on the rhythm and timing of the breaths you take, your focus will become sharper - partly because you will not be dwelling on all the typically negative "what if's," and partly because you will increase the oxygen level in your blood. Just make sure you don't overdo it and hyperventilate. Use lip gloss or lip balm. Often when you become nervous your mouth dries out, especially your lips. We then mentally make the attribution that our dry mouth proves how anxious we are and this reinforces our thought that we are nervous. It's a vicious circle. There are two ways to intervene: We can change our attributions and we can treat the symptoms of anxiety such as dry mouth. A simple application of lip gloss, lip balm, or Vaseline will keep your lips moist and increase your comfort level. Talk with participants before presenting. Talking with participants before the presentation starts can be a great way to relax. The reason is that after you've shared a few pleasantries or shared a few laughs, the ice is broken. When you take the stage, you are no longer speaking to a group of strangers. As a bonus, you may get some valuable clues on how to better align your presentation with that particular audience's needs and expectations. As an added bonus, by focusing on the participants, you will be less likely to focus on yourself and your own nervousness. Know your opening and closing cold. Know your opening and closing so well that you could present them in your sleep. Almost all presenters we interviewed reported that once they get through the opening and it goes well, there is a big sense of relief. On the other hand, when the opening doesn't go well, there is a marked increase in distress. Aaron: I have a standard four- to five-minute humorous opening specifically designed to read the audience. It's some of my sure-fire material that I have high confidence in. I know that when I get my usual response, I'm going to have a good presentation. On the other hand, when the response is subdued, I know I will have a tougher go of it. When my best material doesn't work, I know I will have to make adjustments to my presentation and/or brace for a less-than-satisfying presentation. If I constantly changed my opening, I wouldn't know if the problem was with the material, with the audience, or with me. Similarly, knowing your closing as well as your opening will give you added confidence at a critical point in which many presentations are made memorable or forgettable. Remember the laws of primacy and recency - we remember best that which we hear first and last. Therefore, your conclusion should be as perfect as possible. If you close as strongly as you open, you will be well on your way to becoming a masterful presenter. Make eye contact with friendly participants. In any audience there will be friendly faces - find them, they will give you reassurance when you need it most. Start by making eye contact with a friendly face in one part of the room, and then do the same thing with someone else in another part of the room. Search out the participants who are nodding in agreement as you speak. There may be a sparkle in their eyes or an encouraging smile. Come back to these people when you start to feel uncomfortable or ill at ease. Soon you will be feeling more comfortable with most, if not all, of the participants. To help you increase your sense of control in developing and delivering your presentation, ask yourself the following questions: "To gain more control over the development and delivery of my presentation, how should I behave differently?" or, "How can I structure my personal environment/situation/life so I have more control?" If possible, check your conclusions with an objective colleague and then design a plan to act on your recommendations. You may want to pay particular attention to how you could increase and demonstrate a higher level of commitment to finishing your presentation, how you deal with and overcome roadblocks, the level of persistence you apply to your work, the types of attributions you make when you encounter an obstacle or make a mistake, and how you could better control excess anxiety. Answer these questions as specifically and in as much detail as you can in Exercise 6-3. Please write down the steps you could take to increase your control over developing and completing your presentation in a reasonable amount of time. In summary, you always have more control and more options than you think. Sometimes it just takes a little help to see that you do. Even though it may be difficult to admit to yourself that you need help, it is a statement of strength rather than of weakness. You owe it to yourself to explore all of your options. Getting good help is one option that should not be overlooked. The worst kind of children are grown-ups. Now that you are managing yourself more effectively by monitoring and changing negative attributions and negative self-talk into positive attributions and positive self-talk, and you have increased your internal locus of control, strengthened your commitment, and overcome perfectionism and other internal roadblocks, it is time to face the issue of difficult participants. Difficult participants can knock us out of the zone of peak performance and they are likely to appear when we least expect them. There are two types of difficult participants: situationally difficult and chronically difficult. Well-versed presenters do not get discouraged by these individuals, rather, they learn from them. All of us can be situationally difficult. For whatever reason, some days are just more difficult than others. Chronically difficult people are difficult most if not all of the time. These are the kind of people who can't have a good day until they've ruined someone else's. The effective presenters have learned the Law of Non-Resistance. The Law of Non-Resistance states, "Everyone who comes across our paths, comes across our path for a reason, to teach us something about our own skills and talents." When it comes to dealing with difficult participants we have three choices: We can become a victim, a survivor, or a thriver. In this section we will learn to thrive - or at least survive - difficult participants by learning the power of a correct diagnosis, the power of the change first principle, the power of appropriately increasing one's muscle level, and the power of asking the audience how they would like to deal with the situation. A colleague Pat Lasaruk, says, "You can change your reaction to people's reactions to the material by asking ‘What do the participants need?’ In other words, being more focused on being a vehicle to their learning/development than worrying about yourself. As a presenter you need to get over yourself!" This is easier said than done, yet all self-aware presenters have done it. Cavett Robert, the founder of the National Speakers Association, said all good speakers go through three phases of development. The first phase, where every speaker starts, is concern about oneself. In this phase, the speaker is consumed by such thoughts as, "How do I look and how do I sound?" Presenters who never get past this "I-focused" phase let their personal insecurities and anxieties keep them from connecting with their audience. Presenters who learn through practice and perseverance to get over themselves then move to the second developmental phase: concern about your message. That is, the now-confident presenter is most concerned about the value of the information being presented. When this phase is mastered, Robert says, you move into the third and final phase of maturity: concern about your audience. This is where good presenters become great and superb presenters are made. At least half of any medical cure is a correct diagnosis. As a presenter, you have to determine if you are dealing with a difficult person. We all have bad days or troubling issues that can make us difficult in certain situations. Other people are consistently and persistently cantankerous and for no particular reason. Therefore, we have to learn how not to take it personally. It may be that the man in the second row is not paying attention because he has just had an argument with his wife. Sean: I remember doing a presentation where one of the participants seemed totally disinterested. In fact, she refused to even make eye contact with me. I fretted about trying to reach her during the whole presentation and I am sure that the presentation was less effective because of it. I also must admit that I felt very relieved once it was over. After everyone left, I commented to the presentation organizer that I was sure I would get at least one poor evaluation. The organizer immediately knew who I was speaking about even though I didn't mention her name. The organizer then said, "Oh, I talked to her on the way out and she loved your presentation. In fact, she said it was one of the best she had ever attended." I was dumbfounded - my diagnosis could not have been further from the truth. Aaron: I have had similar experiences in which I misread the listener's response. I was presenting a full-day program to a roomful of lively and responsive people. That is, everyone was lively and responsive except one. Three rows back and on the center aisle was a woman who was clearly not having a good time. She didn't take notes, she didn't answer questions posed to the group, she didn't participate in any activity, and when the audience laughed, she frowned. For the first hour or so, I obsessed over this. I was confident that I could "bring her around." Yet, every attempt to draw her into the fun and excitement failed. After about 90 minutes, I gave up and wrote her off. At the end of the day as I packed up my materials, she walked toward me. I thought "Uh-oh. I'm about to find out just what she didn't like." Imagine my surprise when she said, "I just want you to know that I learned more in this program than from any I've ever attended." Wow, did I ever misread her. What I took as disinterest was instead intensity. She was so focused on learning that she wouldn't allow herself to be distracted by all the other "lively and fun" activities. What I learned from this is that some people's outward appearance belies their true feelings. As these examples illustrate, sometimes the difficult person turns out to be ourselves. We know the topic and the materials so well that we don't set up the presentation properly. In any presentation it is helpful to highlight that the tone/opening you use goes a long way to clarifying expectations and setting the tone with the participants. Clear agendas and guidelines for how the presentation will be structured are important to most people. On the other hand, there are difficult people in the world and their difficulty comes in varying degrees. The Change-First Principle states that if you want to change the behavior of another person or your relationship with that person, you first have to change your own behavior. In a similar vein, the literature on Brief Solution-Focused Therapy states: "If it is working, do more of the same; if it isn't working, do something different." Doing the unexpected, the Change-First Principle, and "if it isn't working do something different," all have a common element. That element is changing a behavior pattern. When the old pattern no longer works, try a new pattern that does. In order to do this more frequently, we have to be aware of when we are at a "choice point" - those critical points in a situation when, if we choose to do something different, the situation will move forward toward a resolution. On the other hand, if we choose to do more of the same behavior, we will continue the old pattern, reach an impasse, or escalate into a conflict. As presenters, we are constantly negotiating, as the following example illustrates. Sean: My workshops are highly interactive, and the participants spend a lot of time doing simulations and role-playing in the workshop. Just before the beginning of one workshop, one of the participants, Bob, came up to me and said, "I don't believe in role-playing. It is a complete waste of time. I have been to lots of workshops. I have never learned anything from role-playing and I refuse to do it in this workshop." This worried me because my workshop is highly experiential and I have three to four negotiation role-play simulations planned over the next two days. I replied, "There are some things that are difficult to learn any other way." Bob replied, "That's just a motherhood statement." Obviously I wasn't getting anywhere with this approach, so I changed strategies. My response to this statement was, "I am willing to be wrong." To my surprise, Bob replied, "I am willing to be wrong, too." Bob went on to participate in all role-playing in the course and even volunteered to participate in the most difficult role-play in front of the whole class. Hence, changing my behavior changed Bob's behavior. In summary, we would all do well to follow the advice of presenter Janet Laap: "If you seek out difficult people, you will find them, or you will create them. Do your homework, align with your audience's needs, expectations, and aspirations, go to where they are without forcing yourself in." When negotiating, the muscle level is the amount of power or force you bring to the table. There are two common mistakes when it comes to using power: too much too soon, and too little too late. Let's see how we can apply the concept of muscle level to dealing with difficult participants and how to apply different levels of muscle depending on the level of difficulty we are dealing with. As stated previously, at least half of any medical cure is a correct diagnosis. Similarly, dealing with difficult participants requires a correct diagnosis of the problem and of the amount of power or force necessary to rectify it. We will now look at how to match the amount of power or force we bring to the situation at various muscle levels. Consider a situation in which a particular participant seems to have it in for you and the topic of your presentation. Muscle Level One: Get more information. See the person in private during a break and engage him or her in light conversation. Try to find out as much as you can because some of this information may shed light on that person's behavior. Sean: At one of my presentations, one of the participants seemed not to be paying any attention whatsoever. This surprised me because I have given this presentation numerous times before and had always been successful. Secondly, all of the other participants in the room seemed to be fully engaged. Half way through our conversation at the break, Rob told me that he had just been informed that he was losing his job through downsizing, that he had always had excellent performance appraisals, and that he had gladly moved his family several times to meet his employers' needs. He went on to apologize for finding it hard to concentrate because he felt so betrayed and poorly treated. I told him that I understood, that he was welcome to stay or leave, and that I had some excellent materials on resume writing that I would be glad to send him. Rob decided to stay in the training because he felt that the skills would help him in future positions. After our discussion, Rob concentrated extremely well considering the circumstances. Muscle Level Two: The person continues to be disruptive both to your teaching and to other members of the audience. At this point, you can ask the other participants for their input. Describe the problem as a process problem, not as a person problem. In other words, don't ask the group to help you label Bill's behavior as disruptive, boorish, immature, and destructive (even though you may really want to do so). Instead, ask a process question. Ask the participants if they would rather proceed in the direction and manner you have proposed or if they would like to move in the direction, and/or manner that the participant proposed, or if there is a third alternative. Being open to suggestions, and being assertive enough to bring the issue forward will increase your credibility. Most of the time the participants will make it clear that they want to follow your direction and this will effectively silence your critic/distracter. In a very few cases, the participants will suggest an alternative that will work more effectively for all concerned parties, and in even fewer cases they will agree with the direction that your critic has proposed. Your job now is to act on the wishes of the participants. Don't be afraid to ask for their help in formulating the new agenda. After the agenda has been agreed to, don't be afraid to ask for a break so you can regroup and plan the next segment of the presentation. Muscle Level Three: At this level, the difficult person starts disagreeing with everything you say and tries to take over the presentation by monopolizing all of the air time, and so on. You have met with the person individually and tried to negotiate a settlement to no avail. What this person is counting on is that you will not say anything publicly in front of the group, even though he or she is disruptive in front of the group. Now is the time to call the difficult person's bluff by taking actionable steps. For example, you can ask the group for their input in how to proceed. There are three possible outcomes: the group will side with you and ask the disruptive party to stop; the group will side with the difficult person and you will get some very valuable feedback about your presentation style, the group dynamics, or both; or the group will suggest a solution that will allow both you and the difficult person to agree by changing or improving the presentation and each of you will also be able to save face. Please note: Just as in medicine, the higher the level of the medical intervention, the greater the likelihood of side effects. The same is true when using increased muscle level as a presenter. The good news is, the more you present and the better you know your material, the less likely it is that a participant will try to give you a hard time. If they persist, you can then, in good conscience, move up to Muscle Level Four. Muscle Level Four: At this point, the situation is intolerable. You have tried everything you can to make it work and clearly it is not. You are clearly in your right to ask the other party to leave. If he or she refuses, you still have a number of choices. You can say that either he or she will have to leave or you will. Please note that this will rarely happen, if ever. In fact, it has never happened to Sean or to David. However, it is important to have a strategy in place just in case it becomes necessary. Each of these strategies is risky, but so is continuing under intolerable circumstances. Another alternative is to call a break, then call a colleague and ask for his or her help in processing the situation and your alternatives. I have found that the best way to deal with difficult audience members is to let the audience deal with them. For example, I teach at several senior executive management programs. Sometimes the participants aren't used to listening, but there are subtle ways that if they violate the group norms or the group's wishes, the group can deal with it most effectively - the worst thing you can do is to become arrogant. For example, if they start pontificating about general management, I say something such as, "I'm not in general management. What I am interested in is the effects of demographics on retail or policy or ... (fill in the blank)." If they continue, I suggest that they can cover whatever they are interested during a different session. In other words, I try to put very clear boundaries on what my session is about and what it is not about and suggest that we concentrate on what today is all about. Then I relax the boundaries in the question and answer period. One strategy Aaron finds effective when faced with a persistently difficult participant is to say: "You have a good point and one that probably deserves further discussion, but our schedule won't allow me to address it fully at this time. However, if you wish to stay after the program ends, I'll be glad to continue our discussion." This sends a signal to the participant and the rest of your audience that you are moving on and it implies that line of discussion is now closed. Aaron also finds it interesting that often the person whom he invites to stay for further discussion either offers some great insights that deepen his understanding of the subject at hand, or the person is the first to leave at the end of the program because that person was only interested in seeking attention. Occasionally, a presenter can become too complacent. He or she has mastered the art of self-management and knows the material so well that no difficult participants would dare to "mess with him." At this point, it may be tempting for this presenter to say that he or she has seen it all. However, all of the presenters that we interviewed warned about complacency. It seems that, just as soon as they have said to themselves that they have seen it all, difficult situations and unforeseen circumstances arise to humble even the most seasoned presenter. In the final section of this chapter, we will look at how veteran presenters have learned to deal with difficult and unforeseen circumstances. The first scenario deals with a noisy hotel renovation that was taking place just below the seminar room. To make matters worse, the hotel staff was trying to pretend that the noise of jackhammers emanating from the room below wasn't really interfering with the presentation. In this case, our presenter had to use the concept of Muscle Level with the hotel staff as the following example demonstrates. Paul was presenting to a group of contractors about the new Safety Act that had recently come into effect. He had the audience's attention right from the start by telling them that 90 percent of accidents are preventable and predictable and how by judiciously applying the safety standards, there had been 25 percent decrease in industrial accidents in the past five years. He was about to continue when the sounds of construction began intruding into the room from the floor below. The first thing that Paul did was to validate his perception that the participants found the noise distracting and they confirmed they did. Paul then called the hotel operator to report the problem from the phone inside the room. He was told that someone from maintenance would be sent up immediately. Five minutes went by and the sounds were getting louder and louder. Paul called again and was again told that someone would be there immediately. Five more minutes went by, and it was very difficult to keep anyone's attention. Paul was told that the construction workers would do their best to keep the sounds to a minimum but the construction had to be completed for a large convention that was coming to the hotel the following week. The sounds were becoming more and more intrusive. Next, Paul called the hotel manager and asked him to address the audience of his presentation because they were all having difficulty doing the work that the session was designed to accomplish. The hotel manager addressed Paul's group. They told the manager that it was impossible to concentrate in the room. Paul pointed out the cost in terms of the hourly salaries of the attendees that were being lost as well as to the hotel's reputation as a meeting/convention site. The construction was halted. The session was a success and the participants not only appreciated the content of the session, but also Paul's assertiveness. Through Paul's use of Muscle Level, he made sure that his attendees were treated as well as possible. In addition to having to deal with circumstances you can control, self-aware presenters have to learn how to minimize distractions that they cannot control. One of the most amazing presenters that Sean has had the pleasure of hearing was Yvonne Dolan. There were about 50 people attending her presentation and for some reason, the audio system started making strange high-pitched noises. The technical people went to work, but the noises persisted. Yvonne was completely nonplussed as she asked the attendees to think of the sound as baby whales calling to their mothers. Although the sound persisted, the intrusiveness of the sound did not. Eventually the technicians located the source of the problem and corrected it. In all his years of giving and attending presentations, Sean has never seen anyone deal with an uncontrollable distraction so brilliantly. A colleague, Jim Comer, suggests: "Acknowledge the obvious. Whether it's a distraction or a disaster, don't pretend it did not happen. Acknowledge it, address it, and if possible, use it. If you ignore it, people will think you are oblivious to your surroundings. And if they think you are oblivious to your surroundings, they may infer that you are oblivious to your audience, and maybe even to your subject matter, as well." How many of you in the back of the room read lips? Whatever that noise is, it's getting closer! You know, I'm actually starting to like that squeal. Another favorite example is from an interview with presenter Janet Laap. She was speaking at a conference in San Diego. The venue was a large tent, which had a huge echo, and there was absolutely nothing the technicians could do about it. Janet's response to the echo was to say to the audience, "It's actually a better deal because you can hear me twice." Janet added, "It's important that we give our audiences permission to relax, knowing that we are handling it." It is also important to remember not to get angry, no matter how frustrating the situation or circumstance may be. Amateurs lose their tempers; professionals do not. Aaron: I had a circumstance in which just about every piece of equipment I was using failed. The LCD projector wouldn't project. The sound system cut out intermittently. The lighting couldn't be adjusted. The easy thing to have done was to blame someone, or make disparaging remarks about the facility. But I knew that would be a bad reflection on me. Instead, I laughed off each problem as a "new learning opportunity." The audience understood my frustration, but they appreciated my poise. Whether the problems that arise are your fault or not does not matter. What does matter is the grace with which you handle them. Roz Useroff, who teaches etiquette, says the sign of a real host is that he or she makes his or her guests feel comfortable. The most effective presenters make their audiences feel comfortable - even under the most trying circumstances. Hidden agendas can be some of the most difficult situations with which any presenter has to deal. However, if you handle them correctly, you have a great opportunity to enhance your credibility as the following two examples illustrate. Aaron: I teach a Business Writing Basics course. Though some people will admit they are not good writers, almost everyone comes in with an attitude of "I already know this stuff." Aware of that prevalent attitude, I acknowledge the obvious: "I know that you are effective writers or you wouldn't be here today. It's the people who sent you who really should be here, right?" This gets a modest laugh and lets them feel superior. Then I say, "But even effective writers can be better if we eliminate a few blunders that even careful writers make. So let's take a quiz to see just how careful you are." Then I give them a quiz on the common writing and grammatical issues that confuse most people. It's a fair and relevant quiz, but a hard one. We grade the quiz as a group and then I say, "If you scored 100 percent, you don't need this class - go home, you're finished for the day. So who gets to leave?" No one ever raises their hand. Then I ask, "How many of you made an A?" Rarely does anyone score this high. "How many Bs?" Perhaps 25 percent fall in this category. "How many Cs?" The majority scores in this range. And then I ask, "And how many of you don't want me to ask the next question?" Nervous laughter follows. Then I say, "So we've found a few of you who need a little refresher on some of the basics, right? And that's what we're here for today - to remind you of what you already know and to help you be just a little bit better." The purpose of this activity and exchange is to emphasize two key points: 1) to acknowledge that attendees know a lot already, and 2) to assure them that I can supply them with at least a few tips to make them even better. It effectively diffuses the "I know all this stuff" attitude that can be so counterproductive if left unchallenged. Sean: It was mid-August, and the organization I worked for had a contract to do a workshop on Participatory Management to a group of mid-level managers for the federal government. When I began the presentation, I couldn't help but notice that the audience was incredibly hostile. I had a room of 20 apparently very angry participants staring at me in defiance. When I asked them for their expectations, the answers were non-existent, hostile, or sarcastic. I immediately stopped the presentation and asked what was going on. Did I get an earful. Paradoxically, although it was a workshop on Participatory Management, the participants had been told by their manager that they would, in no uncertain terms, attend the workshop in mid-August. The fact that many of the participants in the room had already asked for and were granted this time for their summer vacations - including one family's trip to Disney World that they had saved for more than five years - seemed to make no difference to this group's manager. The irony of forcing people to take a workshop on Participatory Management would have amused me, if I had not been tasked with teaching the workshop. I then asked the group to look at the options we had regarding the workshop. Although many of them would have liked to cancel the workshop, this was not a viable option. After I allowed them to vent and they could see that I was not part of the problem, they agreed to learn as much as they could and deal with their manager in another way. To this day, I am still very appreciative of the maturity of the participants who were in that workshop. Sometimes even if you work at being as well prepared and as well informed about the audience as possible, things will happen or be announced at the last minute that will put a pall over the group to whom you are presenting and there is nothing you can do but go with the flow and salvage as much as you can from the presentation. Sean: At one point, I did a lot of staff training at a local university. The staff had never had training in the past and was very appreciative of the training, which made them a pleasure to teach. Imagine my surprise when I entered the room to teach a course on Improving Personal Productivity and was met by a sullen group with hostile stares. It seems that it had been announced the day before that the vice president of operations for the university had just hired a consulting firm to do a time and efficiency study on the university's staff. Both the staff and their union felt that the process was very intrusive, would lead to staff reductions, and would produce poorer levels of service at the university. The fact that the time and efficiency studies would only be conducted on staff, and not on the university's administration, was particularly galling to the staff. The fact that I was being introduced to give a presentation on improving productivity by this same vice president of operations also added to my less-than-welcoming reception. Bill Caar, a humorist, talked about being asked to give a humor presentation to a particular group. Just a few minutes before Bill was to present, the company's CEO announced that one of the company's most cherished and youngest employees had just been killed in a tragic car accident. The CEO then asked for a moment of silence before Bill was supposed to start his "humorous" presentation. Another example is that of an accountant who had to give a presentation to the company's employees telling them that the company's chief financial officer had just been found to have embezzled most of the employees' pension funds. As Bill Caar says, "Sometimes it doesn't matter how prepared you are, you can't recover and you just have to ride it out." Barbara was giving the most important presentation of her life. Not only were her boss and boss's boss there, the entire board of directors of her company was in attendance. Barbara had never prepared a presentation so carefully in her life. She conducted numerous dry runs, and then the big day finally arrived. What Barbara hadn't planned on was that her laptop would die just before she began her presentation. Unfortunately, she didn't have the presentation on a flash drive or DVD, if she had, she could have just borrowed someone else's computer. Because she had never had a single problem with her laptop, she hadn't thought to make transparencies. What she did do, however, was to make detailed handouts. Like a true pro, she started her presentation with some humor that she had a slightly used laptop for sale and then began her presentation as if nothing out of the ordinary happened. Because Barbara was so composed, her audience didn't notice that they didn't have the planned version of the slides to look at. You can also be sure that now Barbara never travels without a back-up flash drive or DVD. There are other unforeseen circumstances that are impossible to ignore. Sean: I was teaching in South Carolina, on September 11, 2001. We started at 8 a.m. We took our first break at 9:45 a.m. I was in the process of organizing some of my materials when one of the participants came up to me and said that there had been a terrible accident - a passenger plane had crashed into one of the World Trade Towers. We decided to continue the class until the second break at 11 a.m. At that time we heard that another plane had hit the second World Trade Tower - that it was probably a terrorist attack - that several other planes had been hijacked - and that the potential loss of life in New York was horrendous. There was a surreal sense in the room. Could what we were hearing really be true? There were no TVs in our training complex; however, the participants were getting both similar and sometimes quite different information from their mobile phones. As a group, we decided to work until noon and take an hour off for lunch to fully assess the situation and see if this unbelievable chain of events could possibly be true. When the participants came back at 1 p.m., we knew that the unbelievable stories were true. We determined that no one in the room had relatives in New York so we decided to proceed for another hour, which would give me time to assign a short homework assignment and end the course for the day at 2 p.m. It was a difficult choice. If I continued the course, it would be disrespectful of the thousands of people who lost their lives, and I wasn't sure if any of us could pay attention to the course material. If I had cancelled the course outright, it would seem like the terrorists had achieved their goal of disruption even more. So I decided what could be left out and still give the participants the best course possible under these terrible circumstances, and asked the participants if they could work for an additional hour. They agreed that this was the best option under the circumstances. I started the next day with a minute of silence for all of those who lost their lives in the terrorist attack. It felt like we were under the weight of a heavy burden. However, the participants worked hard and we made the best of a very difficult situation. On the third day of training, it was announced that their company would donate $1 million to the American Red Cross disaster relief fund. At this, everyone in the room felt proud to be associated with their employer. There was something that their company was doing that was concrete and tangible. It also helped us focus on the work at hand. I was surprised that the course evaluations were as good as they had always been. There was, however, one particular piece of feedback that I will always cherish: "A special note of ‘Thanks’ and a big ‘well done’ too for recognizing the impact of the bombings on Tuesday's class and for having the professionalism and skills to not only salvage the course, but to make it worthwhile." Accomplished presenters have the seasoned judgment to know when to recognize that there are circumstances that are affecting the participant's ability to learn. They have also learned how to deal with these types of situations as sensitively and tactfully as possible. They also know when to ask for feedback from the group that will aid in making the best decision possible about if and how to proceed. At this point, you have developed a dynamic presentation, have done your homework so you know your audience, developed superior organization, and made your presentation memorable, actionable, and transferable. You have also practiced so much that you know your presentation cold. You have also mastered how to deal with yourself, difficult participants, and difficult situations. You are now miles ahead of most presenters. However, there is still one critical difference between you and the skilled presenters interviewed for this resource. These presenters don't stop here. They constantly engage in the process of total quality improvement, and that is the subject of our next strategy.